The Fighting Scots football team squeezed by DePauw University and came away with a huge 24-21 win last Saturday afternoon. 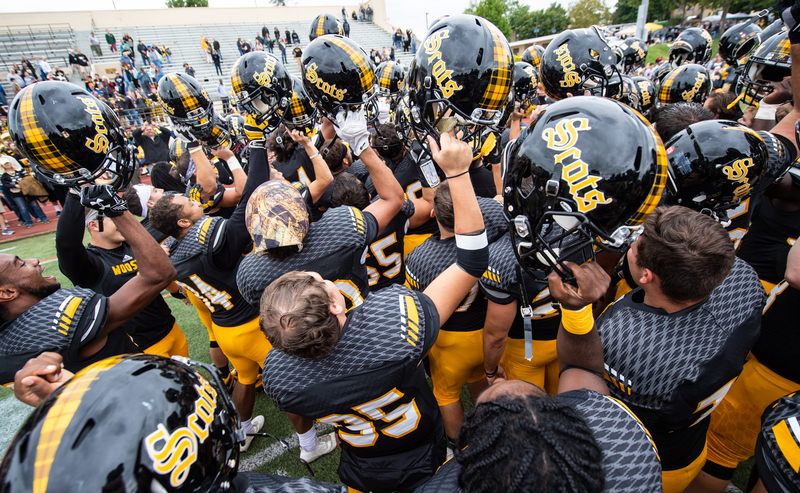 The Scots earned the win they were looking for on a fun and eventful Black & Gold weekend as campus was bustling with energetic fans eager for victory. The game’s score line opened with DePauw’s Demarco Henry running in for a three-yard score to put the Tigers up 7-0 late in the first quarter. The second quarter was the difference maker for the Scots, as they exploded for three touchdowns: two offensive and one defensive. Wooster Quarterback Mateo Renteria ’22 had an outstanding game, throwing for 388 yards and two touchdown passes. Early in the second quarter, Cole Hissong ’22 caught a 24-yard touchdown pass from Renteria, evening the score at seven a side. Five minutes later, DePauw punter Ty Johnson dropped a snap deep in his own half of the field, recovered it, but then Wooster’s Chase Flanagan ’22 knocked it loose. That left Wooster’s Derrick Florence ’19 to finish the job off: he recovered the ball and ran it in for a three-yard fumble recovery touchdown to put the Scots up by seven. Right before the opening half came to a close, Cam Pollard ’20 intercepted DePauw’s Chase Andries. “I was kind of surprised because the ball was really high and I didn’t think I could get to it,” said Pollard. The Scots were quick to take advantage of that defensive takeaway made by Pollard. Just after that, the biggest play of the game — and certainly the most memorable — happened with 28 seconds left to go in the second quarter. Renteria connected with Nick Strausbaugh ’20 on a 73-yard pass and score to increase the lead by another seven points. “With the spark of Cam’s interception, we felt we could take a shot. Mateo threw a perfect ball and I was able to come up with it and run it in for the touchdown,” said Strausbaugh. “The crowd was rocking, those two plays to end the half were complete game changers,” said Lachlan Davidson ’21. Notably, that was the 20th receiving score of Strausbaugh’s career thus far. The Scots headed into the locker room at halftime up 21-7. Coming out of the locker room for the second half, Strausbaugh called the team atmosphere “exciting.” “We knew we could play like this. We played the first half well … we wanted to show to everyone that we can win tough football games. We were excited to get back out there and finish the game on top,” said Strausbaugh. DePauw opened the second half scoring when Logan Greene caught a seven-yard touchdown pass from Cam Haynes to cut the deficit to seven points. Wooster’s Robert Alvarez’s [’22] fumble recovery right after was another noteworthy play for the Scots, as it gave possession back to them on the Tigers’ 34-yard line. The Scots then tacked on another three points on a 24-yard field goal made by Henry Whyte ’21 with 5:35 left to go in the third quarter. Going into the fourth quarter, the Scots were up 24-14. The only scoring in the final quarter was when DePauw’s Andy Hunt caught a short five-yard touchdown pass from Cam Haynes to make it 24-21 with 9:20 left in the game. The Scots’ defense stood strong throughout the rest of the game. Wooster picked up their first conference win of the 2018 season on Black & Gold Weekend in front of a very excited crowd. The Scots finished with 388 yards of total offense to DePauw’s 285, with Renteria completing almost two-thirds of his passes. Strausbaugh ended up finishing the game with 161 yards receiving and Jacob Lewis ’20 added on another 100 receiving yards. “That win against a school like DePauw in that setting was great. Alumni were able to witness something they haven’t been able to witness in a long time: a victory against one of the strongest teams in the conference. The crowd was crazy. It was mind-blowing,’” said Pollard regarding the win. Next up, the Fighting Scots turn their heads to a matchup against Wabash College on Saturday, Sept. 29 in Crawfordsville, Ind.